Do we back that snack? Welcome Snackbacker.com! This is the one and only snack website you'll ever need. We have expert snack reviews, snack resources, and snack related news. This website is overflowing with both expert and amateur snack reviews. If you would like to submit your own snack review, fill out the form under Amateur Reviews. If you would like to view older snack reviews click on the Expert Snack Reviews. Simply click on a photo above to read a snack story or go to the "Expert Snack Review" page to view all reviews. Trader Joe's Milk Chocolate Covered Potato Chips are as excessive as they are delicious. These little snacks combine the blood pressure rising saltiness of potato chips with the diabetes inducing sweetness of chocolate. The taste of these sweet and salty treats can be described in one word- Awesome! "Our milk chocolate covered potato chips gild the potato chip lily by adding rich milk chocolate to salted crunchy thick cut ridged potato chips. The result? A lipsmacking decadent confection with a delicious combination of flavors and textures." After reading this description I was a little bit confused. Am I the only one who has no idea what it means to "gild the potato chip lily?" 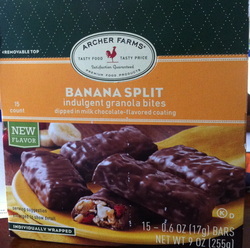 The Archer Farms Banana Split Indulgent Granola Bites are really strange. They aren’t quite candy bars, and they really aren’t a granola bar either. These snacks are about the same size as a fun size candy bar and consist of a hyper sweet chocolate covered granola square filled with white chocolate chips, strawberry flavored cranberries, and dried bananas. 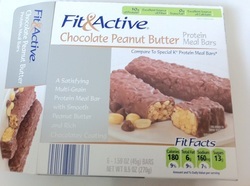 When I first purchased the Fit & Active Protein Meal Bar at Aldi, I didn’t really know what I was getting. I was in a hurry and thought that I was grabbing some kind of chocolate covered granola bar. I was pleasantly surprise to find that I had stumbled upon a new type of snack bar that was delicious and surprisingly not completely unnutriscious (if that’s even a word). If you haven't partaken in some of the offerings in Trader Joe's snack aisle, you are a complete buffoon. I myself was a complete buffoon up until about a month ago. 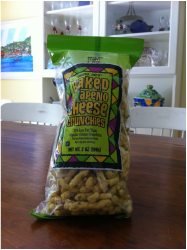 One of the more interesting items to snack on at Joe's is a twist on a classic twisted snack, Cheetos! Baked Jalapeño Cheese Crunchies are a Cheeto like snack that has a few advantages over the traditional mix of fried puffed something and orange powder stuff.